Although they took place nearly 32 years ago, the sad deaths of two brothers and a sister at West Chapple Farm, Winkleigh on September 23rd 1975 still arouse interest. The bodies of Frances, Robert and Alan Luxton were found outside their house, with severe head injuries from a shotgun. Seven years later John Cornwell described the background to the tragedy and the outcome of his investigations in a book called “Earth to Earth”; this proved a best seller, and was awarded the Crime Writers’ Association Gold Dagger Award for Non-fiction. There are many references to it on the internet, and recently a brief history of the events has been published on the Heard Family History* website. The book is out of print, but second-hand copies can be found. I too have a personal interest in the case as a distant relative of mine, the late Fred Lyne, was a principal witness at the inquest. I had occasion to write to his widow two years ago, and in a reply on her behalf to my letter, a neighbour mentioned the book, and said: “The locals tell me it is rubbish”. Further enquiries have suggested that the book was not entirely “non-fiction”, but seems to contain many errors and embellishments of the truth. Nevertheless, it is an enthralling story, well written and well worth reading. 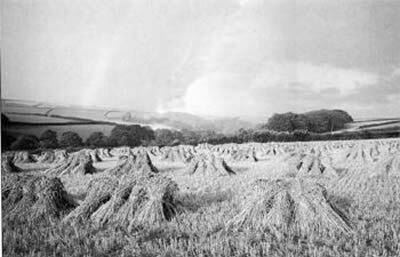 The book was based on many interviews with people in Winkleigh who knew something about West Chapple Farm and the occupants; also on newspaper reports, and letters from Luxton relatives. In particular, Brian Luxton**, who has investigated the genealogy of the family and together with Bill Luxton founded the Luxton Family History Society, provided much information about the origins and ancestry of the Winkleigh Luxtons. Unfortunately a lot of this was condensed in the book, and errors were made in the process, much to Brian’s annoyance. After their father’s death in 1939 the three Luxton children continued to run the farm as he had done, with Robbie in charge. Their farming methods were not unlike those of their neighbours, at a time when tractors were not universally used and combine harvesters unheard of. Their farm has been described by Winkleigh people as a “model farm”. 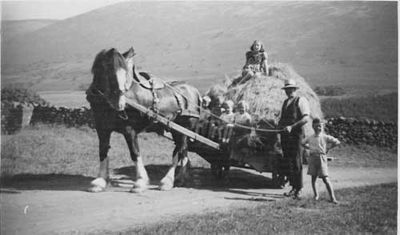 No doubt their crops were "stooked" by hand in the manner of the attached photograph, and their hay carried home on a hay bogey as illustrated in the second photo below taken by me in Northumberland in 1939. They all worked hard, with the help of only two farm labourers, one of them being Fred Lyne, who served them from about 1953 to 1975. In those days labourers did not expect more than two weeks’ holiday a year, nor were they paid if they were off sick; so accusations of parsimony on the part of Robbie might have been levelled at many employers of the time. Although the family did not mix much with the villagers of Winkleigh, Frances at least could be sociable and give help where it was needed. They were not completely stuck in a time warp, and were among the first to have a wireless (about 1923), and a motor car, and certainly had a tractor, electricity, telephone, and mains water in the 1970s, but not television. The family seems to have been running the farm well and working hard during the war and for some years afterwards. Those who knew them well are adamant that there was no question of an incestuous relationship between Robbie and his older sister Frances, as suggested in the book; in fact a neighbouring farmer was quite distressed by this imputation, as his widow has told me in a letter. She also recalls being visited by them in Winkleigh on several occasions on their way to the theatre in Exeter, so they were not as reclusive as they were painted in the book. Although the brothers took no holidays, Frances did sometimes go abroad with a friend. She may have become attached to a sea captain at one time, but nothing came of it. The younger brother, Alan, was 13 years younger than Frances, 10 years younger than Robbie. He was in good health, but although he had a third share in the farm, he had no say in the running of it and was paid wages for all the work he contributed. Not long after the war he fell in love with a local girl, and they became engaged. Robbie and Frances did not approve of this, fearing Alan would move away, and they refused to let him have his third share of the inheritance. The engagement was abruptly broken off, and from this time onward Alan was never the same: he was treated in hospital for an illness that undoubtedly had a psychological element, and remained withdrawn and depressed thereafter. He still worked on the farm, but could not pull his weight. Suggestions were made in the book that his mental state might have been the result of several marriages between Luxton cousins in his distant ancestry, but he had been a normal child and certainly not mentally deficient. His father had been a successful farmer, winning many prizes at fat stock shows, and was a church warden at All Saints Church, Winkleigh; his mother was in no way mentally deranged. It was not until Frances and Robbie reached their sixties that they realised they could not carry on indefinitely, and began to consider selling up. There were arguments and threats between them and Alan, reaching a climax when they found a suitable house to move into, and a sale for the farm in 1975. The inquest concluded that Alan had shot himself in the small hours of September 23rd ; an hour or more later Robbie shot Frances and then turned the gun on himself. However, there was speculation amongst the villagers that Robbie had shot the other two. Robbie had become ill with worry, and Frances was also depressed, so with hindsight one can see that all three had had enough. So ended about 600 years’ tenure of the farm by the Luxtons. 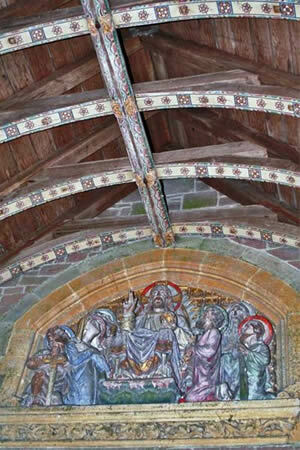 But the parishioners of All Saints Church, Winkleigh had good reason to be grateful to the Luxtons, because they received a large legacy for use in the restoration of their church, where Robbie had worshipped for many years: by this means the whole of the church and tower was re-roofed, the organ overhauled, electric wiring renewed, oil-fired central heating installed, and other work done. And at Brushford, where Frances had worshipped and was buried, another legacy provided funds for restoration of that church. Although John Cornwell had made his own investigations very soon after the tragedy, visiting Winkleigh residents, writing to members of the Luxton family, and researching around West Chapple Farm, he did not work on the book for several years afterwards. 1. They denied that Frances Luxton’s funeral was “wretched” and poorly attended; in fact a funeral service for all three Luxtons was held in Winkleigh Church, attended by at least 120 people, many of them distressed; Robbie and Alan were cremated at Barnstaple while Frances was buried in Brushford churchyard. 2. One of the signatories had been alleged to have said there was “funny business” between Robbie and Frances, but he had no recollection of an interview with Mr Cornwell. 3. They denied that the Luxtons had used primitive 19th century farming methods, and pointed out that modern machinery had been sold at auction not long before their deaths. 4. They contradicted the assertion that there had been a number of suicides in the area, and especially four in one particular family, which was quite untrue. Another signatory, in a letter to me, refuted this in the strongest possible terms. He pointed out the irony of the author winning a prize for "non-fiction" with this book, when it had so many exaggerations and fictional items. Nevertheless, "Earth to Earth" is a good read. ** Brian Luxton would be interested to hear from any member of the family. His address is: Passat, 12 Coldbrook Road East, BARRY, CF63 1NF, Wales.